Simon & Schuster, 9781501163135, 304pp. "Revealing as a three-martini lunch with a smart friend, this candid memoir shows a woman choosing to live happily (if also conflictedly) ever after on her own." "A memoir that will help women of all ages and life circumstances understand the experience of today’s single-and-joyful woman." 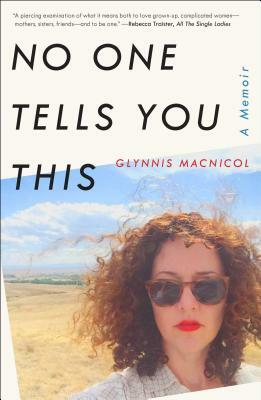 Journalist Glynnis MacNicol has written one of the most frank and refreshing stories about turning forty without a husband or a baby. She manages to both entertain and challenge the reader as she grapples with the best and worst parts of choosing not to build her life around a traditional family. It’s smart and hilarious and exactly as nuanced as you want it to be." "Amid the raft of motherhood memoirs out this summer, it’s refreshing to read a book unapologetically dedicated to the fulfillment of single life. Like a more zoomed-in chapter from Rebecca Traister’s All the Single Ladies, MacNicol’s offering is a personable, entertaining reflection on the author’s 40th year. Though she is known for her exacting, emotional, and poignant writing on things like career burnout and parental illness, as well as founding the women’s networking organization The List, this memoir allows MacNicol a broader and looser canvas." "Engaging and honest...MacNicol is relatable, and the joy she finds in her life, lived on her own terms, is striking."